Two decades of GEF International Waters Projects have created an enormous amount of knowledge, experience and good practices in freshwater resources protection and management. GEF IW freshwater projects, as well as those of partner agencies, have now the opportunity to capitalize on this wealth of experience and enhance their ability to face the challenges posed by the growing pressures of demography, climate variability and change, and the global economy. 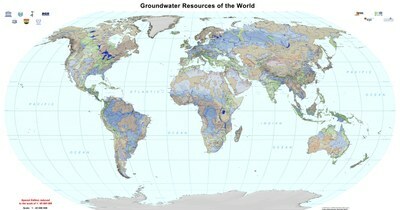 With this objective in mind, IW LEARN 3 (2011-2014) has foreseen the creation of two Communities of Practice (CoPs) on groundwater and surface freshwater. These CoPs aim to accelerate learning from and within the GEF IW portfolio, and promote replication of good practices in transboundary freshwater management. The CoP acts as a catalytic coalition among GEF IW projects to promote learning that meets project-level priorities. They are designed to build on existing knowledge from inside and outside the GEF portfolio and be responsive to the learning needs of the GEF IW projects .The COPs provide an opportunity to link the various projects according to their learning needs, and knowledge and experience available. 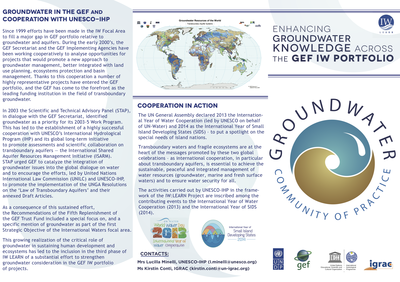 The GEF Global Groundwater CoP is coordinated by UNESCO-IHP.